I recently re-read two celebrated plays of American and British theatre, respectively – Arthur Miller’s ‘Death of a Salesman’ and John Osborne’s ‘Look Back in Anger’. I enjoy reading plays – though some people find it curious. You can pick them up for a few bucks in book shops, they come in thin, handy-sized paper-backs perfect for reading on the train and you can finish them in a day or two. The directness of the dialogue – spoken by interesting, intense, quirky characters – can, I find, be very pleasing to the intellect, and an escape from the drab, bored faces of fellow commuters with their fingers stabbing at smartphones. The last time I read these ground-breaking plays was at university 20 years ago, where I was profoundly affected by both of them. So I was curious to see what effect they might have on me two decades later. 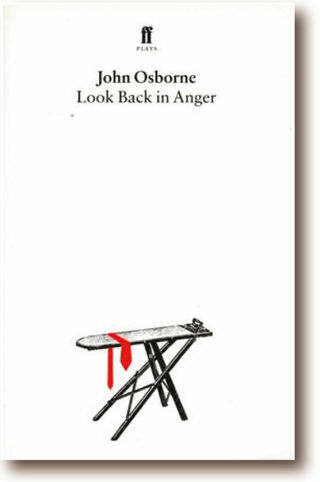 The Faber and Faber edition I read featured a red tie draped over an ironing board on the cover symbolising the play’s domestic setting (it was one of the first plays to be coined a “kitchen sink drama”) and its exploration of the lives of the working classes after the Second World War. The action takes place in a flat in the English Midlands in the 1950s. The chief protagonist is Jimmy Porter – the quintessential “angry young man” who feels he has no place in English society. Without a war or a cause to fight for, he takes his existential frustrations out on his sweet-natured flat mate Cliff and timid, anxious girlfriend Alison. His principal aim is to spark some kind of fight or reaction from Cliff or Alison and later Helena – a posh actor friend of Alison – who comes to visit (and replaces Alison as Jimmy’s girlfriend in a weird love triangle). JIMMY (on a rant): Oh heavens, how I long for a little ordinary enthusiasm. Just enthusiasm – that’s all. I want to hear a warm, thrilling voice cry out Hallelujah! (He beats his breast theatrically) Hallelujah! I am alive. I’ve got an idea. Why don’t we have a game? Let’s pretend we’re actually alive…. And so he goes on – ranting and rallying against the boring weekend papers full of the same vacuous people and meaningless stories; trying to stir some kind of emotional response from his wife ironing away like some kind of Lady Macbeth trying to remove every bit of dirt or discomfort from her life. Alison at first won’t respond to Jimmy’s taunts about her stuck-up brother Nigel or her parents that hated him or how he is sick of being cooped up in a flat on another dreary Sunday. Only through accidental violence (play fighting with Cliff), can he draw a howl of pain and a reaction from her. JIMMY (to Alison): If you could have a child, and watch it die. Let it grow, let a recognisable human face emerge from that little mass from indiarubber and wrinkles. Please – if only I could watch you face that. 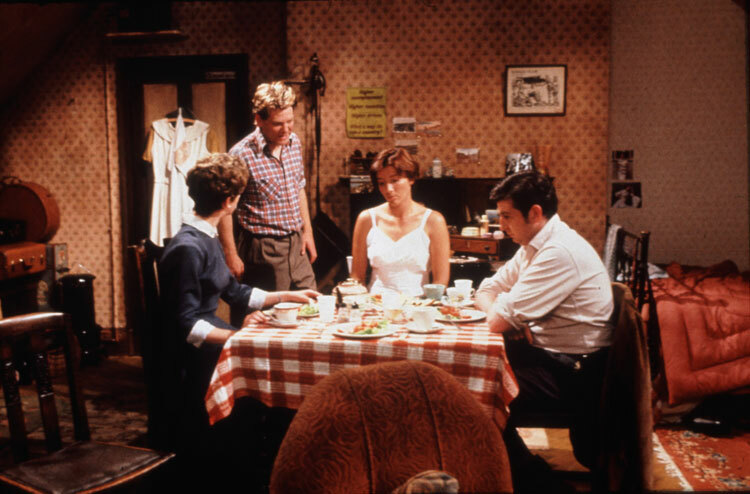 In the end, I just wanted Jimmy to shut-up – even when he was played by the fantastic Kenneth Branaugh alongside Emma Thomson as Alison in a TV adaptation directed by Judi Dench (You can watch the whole play in full on YouTube). It just didn’t ring true. It felt like a silly, dated soap opera – though with the occasional memorable bits of dialogue thrown in the mix. The story of 60-year old Brooklyn travelling salesman Willy Loman who can no longer sell and who cannot face the reality of his own past mistakes and self-deception. It’s also a play about what it means to become worthless in society and how the great American Dream (your own home, family, prosperity) can turn to dust. WILLY: The street is lined with cars. There’s not a breath of fresh air in the neighbourhood. The grass don’t grow any more, you can’t raise a carrot in the backyard. They should have a law against apartment houses. Willy Loman carries some of the anger of John Osborne’s Jimmy Porter – but whereas Jimmy is young and can change, Willy Loman is a broken man, a classic study of failure and of redundancy, with little hope of redemption. 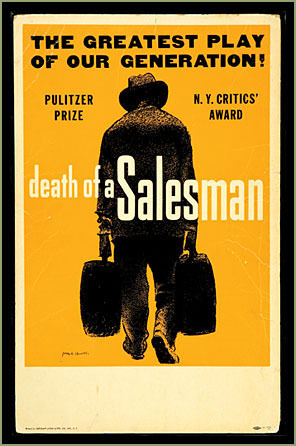 While set in a different era, Death of a Salesman is a timeless classic and has lost none of its power. David Mamet’s 1984 Pulitzer Prize-winning play Glengarry Glen Ross – about real estate salesman fighting for their jobs (made into a superb movie with Al Pacino, Jack Lemmon, Kevin Spacey, Alan Arkin and Alec Baldwin) owes its central theme – meaning through work – to Arthur Miller’s ground-breaking play. 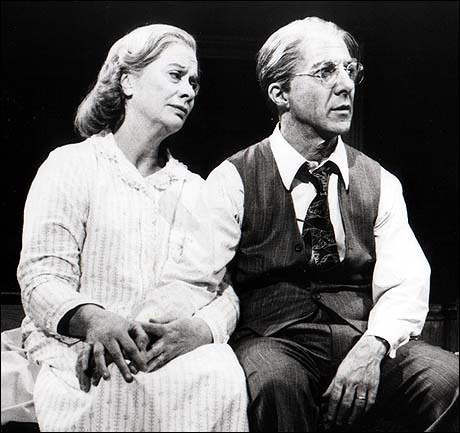 As journalist working in an industry with an uncertain, constantly-evolving future – the fear expressed by Willy Loman of “still feeling – kind of temporary about myself” rings true. Indeed for many working people, the fear of becoming redundant because of technology or of being replaced by cheaper labour in far-off countries is very real as is the sense for older people of waking up 30 years after a career and wondering where all the years went and why you’re still struggling to make ends meet. WILLY: You mustn’t tell me you’ve got people to see – I put 34 years into this firm, Howard, and now I can’t pay my insurance. You can’t eat the orange and throw the peel away – a man is not a piece of fruit. Earlier in this scene, as Willy arrives at Howard’s office determined to get a desk job in the city, he finds his boss demonstrating a primitive dictaphone that records his son’s voice. Replace this device with a smartphone or an iPad and you have a modern day fable. (Make sure you watchthe 1985 TV adaptation starring Dustin Hoffman as Willy Loman and John Malkovich as his son Biff. ← Edward Snowden vs the NSA: who do you believe? Is this a way to IGNORE the unfair budget of the NATION? Come on – you (like everyone have a response to it). Ppl say to let the PAST go & accept change (esp after a death)…sadly, some ppl feel to letting go the BEST of past or memories (or even the worst)…is NOT fair. This NEW gov’t wants to say let go of nation belief (of FAIR GO) – but their FUTURE idea is NOT safe or warm….HOW does that work?